Silvia's journey into the field of health and wellness started in 1979 at the moment when she joined her husband Craig Reid's quest to conquer the deadly genetic disease, Cystic Fibrosis. When Craig started learning Chigong (Qigong) to overcome Cystic Fibrosis, Silvia was his translator for his Chigong (Qigong) teacher, and witnessed and heard many incredible stories about Chi (Qi). She had no interest in learning Chigong (Qigong) herself, until 1984 when she was struck by asthma, allergies and exhaustion. She has been practicing Chigong (Qi gong, Chi kung or Qi kung) ever since, and is currently asthma and allergy free. In 1987, Silvia discovered her gift of reading Qi and Qi flow. Together with Craig, they have been using Chi healing to help people battle against cancer (colon, brain, lung), emphysema, ALS, paralysis, asthma, severed spinal cords, migraines, pain management, arthritis, scoliosis, cystic fribrosis, broken bones, various sports injuries and more. All these were done during her spare time without any financial gain. See below to read more about Silvia and Chi healing (Qi healing). Silvia has been a productive research neuroscientist from 1986 to 2008, working in Universities as a doctoral student, a post doctoral fellow and a research scientist, and in a pharmaceutical company as a senior scientist. Now she is a full time health & wellness consultant/healer/coach. Growing up in a family with an engineer father and a devout catholic mother, Chi (Qi) only existed in Kung Fu novels for reading during those cold rainy days. School science education classes also taught me that Chi could not be real. As more cold and raining days passed by, I was more and more amazed on how Chinese culture harbored such incredible imagination about human ability and wondered where the concept of Chi comes from. In the novels, Kung Fu heroes always used Chi to elevate the power of their techniques beyond physical constraints and were able to manifest their Chi into incredible healing powers. Hands would be placed on an injured hero then Chi would be transferred through the hands into the fallen hero and his injury would dissipate. What an intriguing concept! But all of my education and knowledge told me that this was impossible and merely make believe. All things got turned upside down when I met my husband, Craig Reid, in 1979. 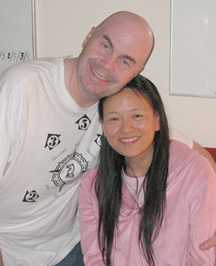 The connection of Chi (Qi) and health became a fact of life for us. I witnessed my husband overcoming a lethal genetic disease, the crumbling of solid bricks with a gentle touch of the hand, and easing illnesses with pointing fingers or placed palms. I overcame my own health problems by practicing Chi Gong (Qi Gong). Then we were shown how to use Chi to heal people. All of these things happened over the course of the years as I was training to be a scientist at National Taiwan University and the University of Illinois and eventually becoming a research scientist at Washington University, Yale University and UCLA. Research has been a significant part of my life, a drive that has steered my research in directions toward finding treatments for human illness. During my research, whenever a new discovery was found, it did not match the excitement I felt when we were able to help someone with our Chi (Qi) healing. With my ability to read Chi and Craig's incredible strong Chi, we have battled so many people's illnesses and injuries, and have fortunately being able to make progress in each battle. It is the greatest sense of fulfillment to be able to see someone getting better. The discovery of the gift of reading Chi was something I never foresaw happening to me in my life. I am sure that I am not the only person on earth who can do this. Yet what might give me a different advantage with this gift is my science training. I tackle what we do objectively and use experiments to differentiate reality from wishful thinking. After 29 years of healing people using Chi, I am totally convinced that Chi does exist and it is a vital factor for health. Throughout my career as a research scientist I have strived to look for treatments for human diseases when ironically it has been staring at me right in my hands. So instead of trying to brush off my gift of reading Chi, I am now devoting the rest of my life to using this gift to bring health, happiness and harmony to the world. You can follower Silvia's Qi (Chi) adventure on her Facebook, blog and twitter. Souied, Reid, et. al., 2008 Experimental Eye Research 87: 168-175. Reid and Farber 2005 Glia 49:397-406. Reid, et al. 2003 Journal of Neuroscience 23: 6030-6040. Reid, et al., 1999 Gene 227: 257-266. Reid, et al., 1996 Journal of Neurosciencce 16: 7619-7626. Reid and Juraska 1995 Journal of Comparative Neurology 352: 560-566. Reid	and Juraska 1992 Journal of Comparative Neurology 321:448-455. Reid., et. al., 1987 Journal of Insect Physiology 33:481-486. 2005 The University of Tennessee at Memphis Health Science Center, The Neuroscience Institute Seminar.